After the regional high school science fair had ended on Saturday afternoon, two youngsters approached sophomore Eli Hanschka, who had just taken home the event’s top prize, grand overall winner, for his engineering entry, “Wave Energy: Harnessing the Power of Waves.” One of the kids asked him what his project was. 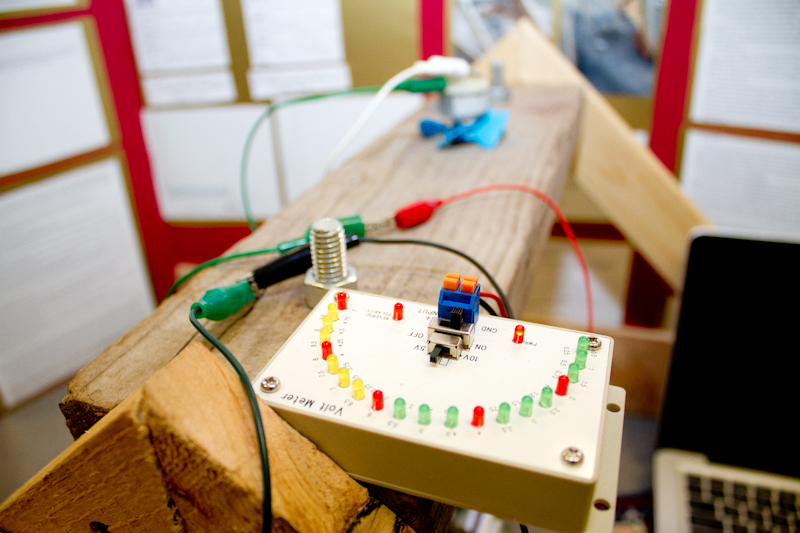 “This is a buoy that makes energy from waves,” Eli said, indicating the structure next to him, with its ring of household insulation circling the middle, and wires streaming through coils and into a circuit board on a nearby table. “Have you ever put it in the water?” the girl asked, looking upward at the tall buoy, which towered over her head. Eli told the Gazette he was inspired by an article his mother showed him about a wave power plant in Spain. An avid surfer and windsurfer, and a member of the high school sailing team, he is more than familiar with the potential of the ocean. “I feel like there’s a lot of power in waves that we haven’t tapped into,” he said. 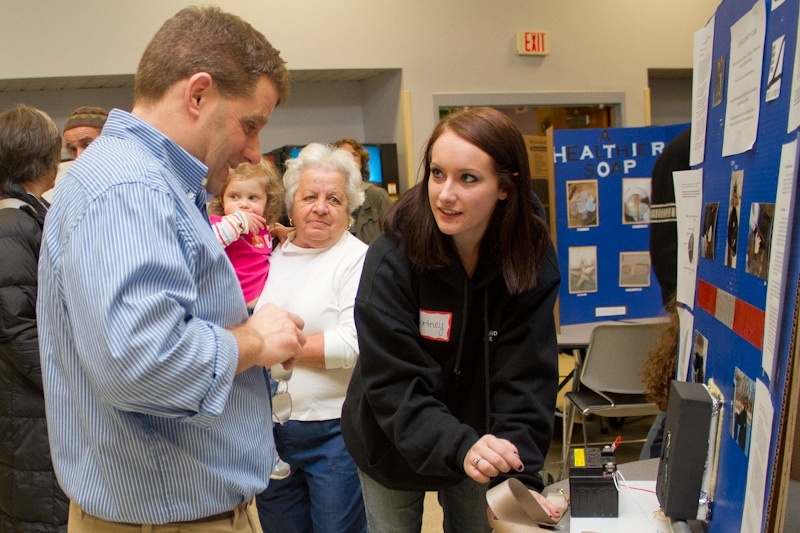 Pragmatism takes center stage at the annual science fair, now in its 14th year. On the surface, the fair aims to get students employing the scientific method to develop and test a hypothesis. Some projects are investigative-based, creating an experiment and summarizing the resulting data. Others, like Eli’s, are engineering-based: they identify a “need of society,” according to the official science fair program, and develop a product or a process to meet that need. Junior Shane Metters created his entry to meet a very specific need. Shane had never entered the fair before, but was asked by one of his summer employers, John Packer of Offshore Engineering, Inc., if he could design a jack-up barge to give dock workers a stable place to work from when they do repairs in choppy seas (barges of this type are often used on oil rigs). Shane came up with formulas to build a 3,000 pound barge. “The equations and the calculations, that was the hard part,” he said. Building the wooden model on display at the fair took hardly any time at all by comparison. It might take a while to build the actual barge, but with Shane’s formulas in hand, Mr. Packer and his crew are on their way. “We’ll be starting on it next month,” he said. Sophomore Maddy Moore got a chance to see how well her project (“Solar-Powered iPhone Charger”) worked when she lost power last weekend during the blizzard. Altoids cases proved equally useful for holding miniature camera supplies, as evidenced by sophomore Zana van Rooyen’s “Al Cam” project. Zana took home a third-place award. 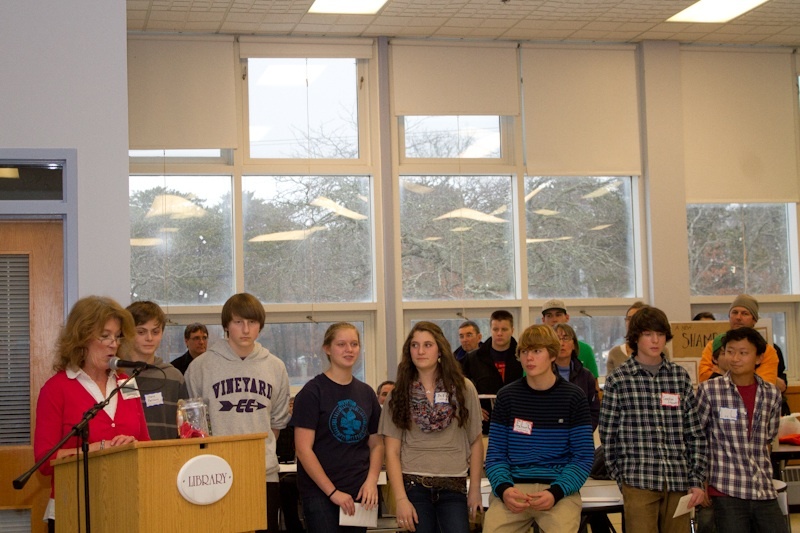 Judges, including some who had made the trip over from the Woods Hole Oceanographic Institute, gathered at the high school at 8 a.m. to debrief and begin investigating projects. Each judge was assigned six or seven projects to score. Judges names three overall winners, as well as multipe first, second and third place winners. Accolades were also doled out for specific categories, such as engineering and investigative projects, and sponsored awards. “The biggest thing was clear hypothesis, clear question,” first-year judge and regional high school student teach Jason Niago explained. “Just to see the amount of work the students put in . . . they did a good job mining all the data,” Mr. Niago said. Seventy-four projects were entered in the main fair, with 13 additional projects entered in the wind turbine competition, which is open to AP Physics students. Paris Bermudes and Marc Natichioni won first place with their turbine. Barra Peak and Sara Thompson were second. Charlotte Hall took third. The turbine competition is judged quantitatively, according to how much output each turbine produces. 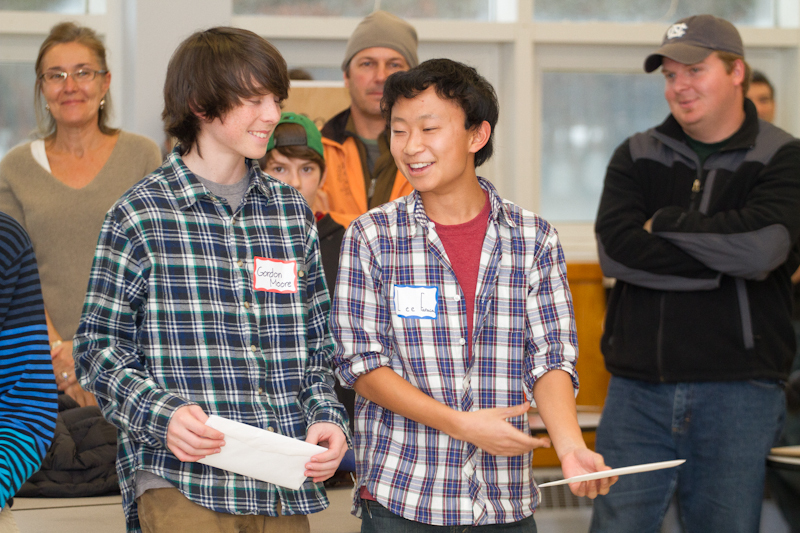 Charlie Parkhurst took home second place in the overall competition for “Measuring Salinity with a Laser,” and last year’s co-winner, sophomore Gordon Moore, won third prize for “Salt-Water Distiller.” Gordon also won the Friends of Sengekontacket Award and the Lagoon Pond Association Award. First-place winners in the general competition were Eli Hanschka, Gordon Gordon Moor, Charlie Parkhurst — the top winners overall — Julia Neville and August Welles (“Fruit Fly’s Living Conditions”) and Lee Faraca (“Passive Solar Heating”). Second place winners in the general competition were Henry Gallagher (“Portable Outlet”), Emily Medeiros (“Butter Softening Mechanism”), Elie Jordi (“The Effect of Angle and Number of Fan Blades on Wind Production”), Charlie Morano (“Distillation”), Margaret Joba-Woodruff and Addison Geiger and Adam Bilodeau (“Parachute Pandemonium”). Third place winners were Zana van Rooyen, Ellie Reagan (“Egg Carton Engineering”), Grant Santos (“Light Up Your Mind: An Investigation into Dimmer Switches”), Samantha Potter (“The Effect of Wastewater on Plant Growth”), Andrew Ruimerman (“Eco-friendly Ways to Melt Ice”), and Maddy Alley and Sydney Minnehan (“How Temperature Effects the Stretch of a Rubber Band”). Andrew Ruimerman also received the Martha’s Vineyard Surfcaster’s Association Award.